Alison Wonderland, the Australian "Trap Goddess” hosts the night at MAO Livehouse as part of EDC's extensive, city-wide afterparty. The first female DJ to independently play on the EDC main stage in Las Vegas, she's hot off the April 2018 release of her latest studio album, Awake, which made it to the Top 10 on Australia's charts. Expect art installations, interactive spaces and groovy, lyrically-driven EDM. MAO's been configured to hold two stages for the event, and on support are DJL, Chopstyx and NEO. 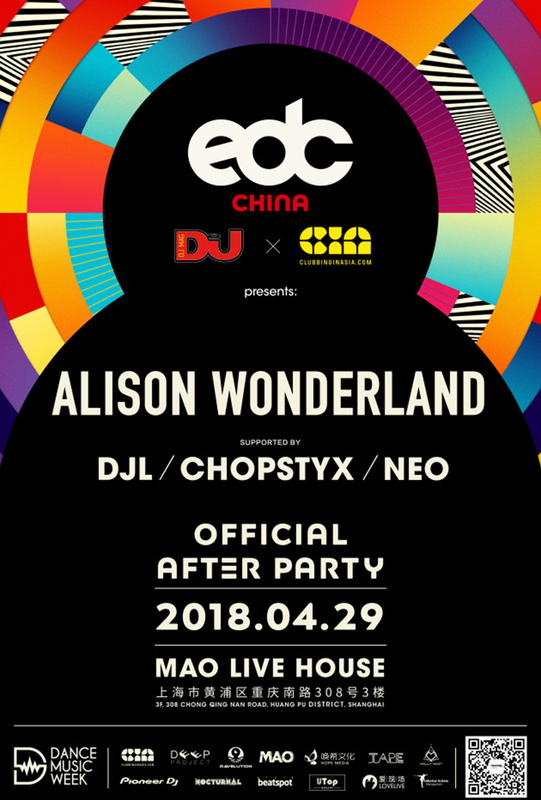 Alison Wonderland, the Australian "Trap Goddess” hosts the night at MAO Livehouse as part of EDC's extensive, city-wide afterparty. The first female DJ to independently play on the EDC main stage in Las Vegas, she's hot off the April 2018 release of her latest studio album, Awake , which made it to the Top 10 on Australia's charts. Expect art installations, interactive spaces and groovy, lyrically-driven EDM. MAO's been configured to hold two stages for the event, and on support are DJL, Chopstyx and NEO.